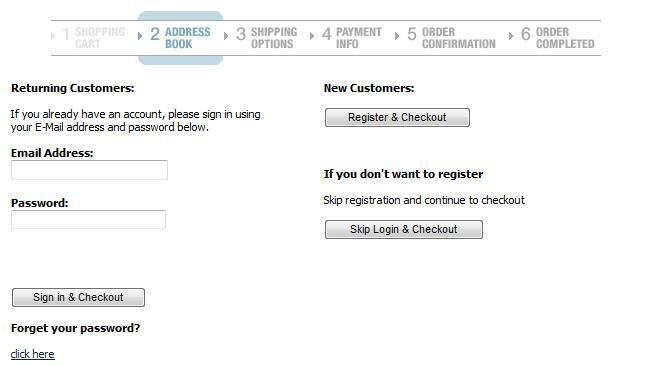 The anonymous checkout feature allows customers to check out without creating an account. Many customers prefer this as it allows them to get through checkout more quickly. It is generally recommended, however, that the feature isn't used unless absolutely necessary. The only thing customers gain is a few seconds spent creating a password during registration, but they lose the ability to reorder automatically, create a wishlist or gift registry, etc. Order management also becomes more difficult, depending on how the feature is set up (see below). NOTE: It is important to be aware of the difference between a regular anonymous customer and a customer who has gone through anonymous checkout. An anonymous customer (as far as the software is concerned) is any customer who visits your site and does something that causes a record to be created for them in the database. This could be anything from adding an item to the cart/wishlist, choosing a locale or currency, etc. Anonymous checkout is a complete order, with the only difference from regular checkout being that the customer cannot log back into the site in the future. AnonCheckoutReqEmail If this is set to true, anonymous customers still have to enter an email address (just not a password) when going through checkout. It is HIGHLY recommended that this is left true. If you do not have your customer's email address it can be difficult to track orders and you cannot send them receipts or other email notifications. GoogleCheckout.AllowAnonCheckout If this is set to true, customers can pay through Google Checkout (if it is enabled) without registering on your site. This is usually required by Google's terms and conditions. PayPal.Express.AllowAnonCheckout If this is set to true, customers can pay through PayPal Express (if it is enabled) without registering on your site. This is usually required by PayPal's terms and conditions. HidePasswordFieldDuringCheckout If using Basic One Page Checkout, this AppConfig will also need to be set to true to enable anonymous checkout. Anonymous.AllowAlreadyRegisteredEmail NOTE: This is a Global Config and only in 9200+ software.If TRUE anonymous users will be able to checkout with email addresses that are already in use. If AllowCustomerDuplicateEMailAddresses is true this has no effect. If AllowCustomerDuplicateEMailAddresses is enabled, the signin logic in MSx 9200+ only considers the most recently registered account for each email address when evaluating passwords for signin. This eliminates issues with confusion of which password to validate to sign into accounts with duplicate addresses. Unregistered accounts in MSx 9200+ (customer records made during an anonymous checkout order) are ignored when considering if an email address is already in use. Only registered accounts will trigger the AllowCustomerDuplicateEMailAddresses handling. The new Anonymous.AllowAlreadyRegisteredEmail Global Config allows users to do an anonymous checkout with an email address that is already in use. Please remember that customers who check out anonymously will never have their credit card information stored, regardless of the StoreCCInDB AppConfig. If store owners need to capture that information, they will need to turn off anonymous checkout. Anonymous customers' sessions end when they close the browser. PreserveActiveCartOnSignin defines what happens to the anonymous user’s cart. If true, the cart items will be moved over on signin. ClearOldCartOnSignin defines what happens to the registered users cart. If true the cart will be cleared, if false the items will remain. PreserveActiveCartOnSignin = true & ClearOldCartOnSignin = true: The cart from the anonymous user will remain. PreserveActiveCartOnSignin = false & ClearOldCartOnSignin = true: The cart will be emptied when a user signs in. PreserveActiveCartOnSignin = false & ClearOldCartOnSignin = false: The cart from the registered user will remain.